Hello, i installed the web services plugin, and i created a web module, and a sample class. 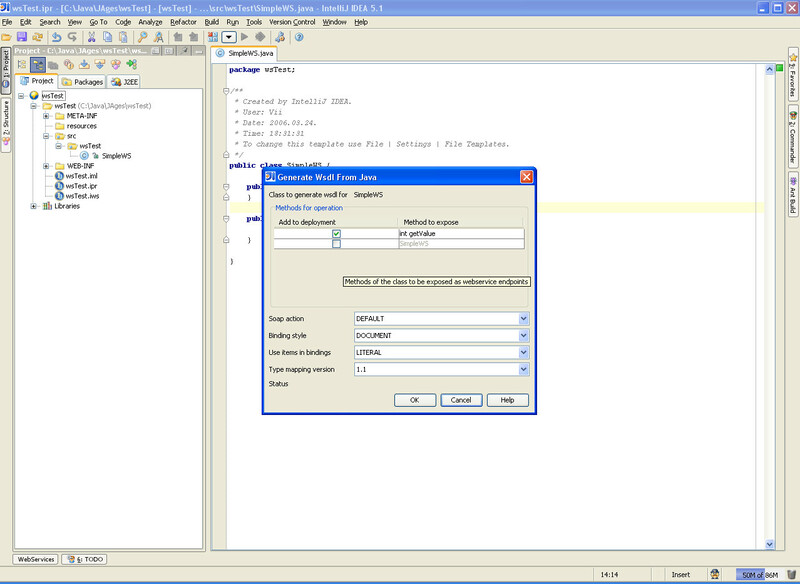 "There is error in launching wsdl 2 java..."
What can i do? Have i forgotten something to install? The problem is not reproduced with your code. post your IDEA log file, the actual exception should be logged. I tried to install ant too... i have no information about installing this plugin. 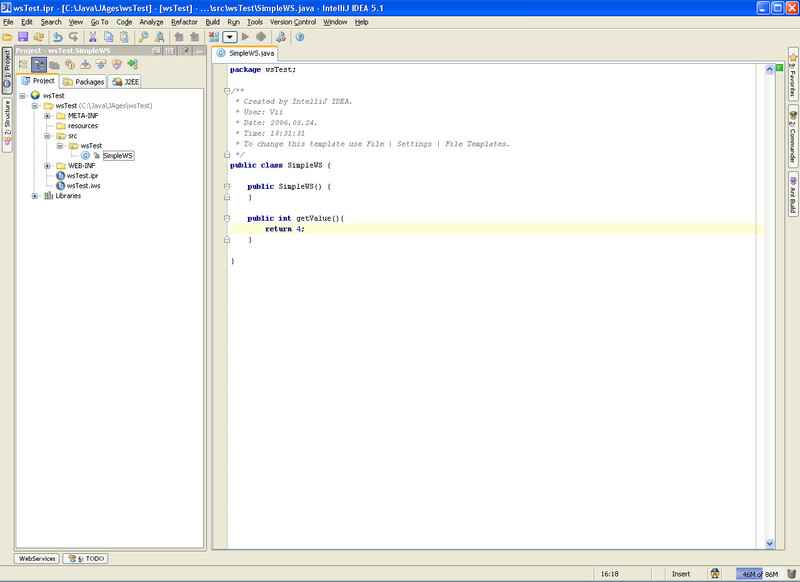 2006-03-25 14:34:46,078 INFO - #com.intellij.idea.Main - Using "FocusKiller" library to prevent focus stealing. 2006-03-25 14:34:47,906 INFO - ecommon.client.impl.ClientImpl - No license server. 2006-03-25 14:34:53,843 INFO - ij.vfs.local.win32.FileWatcher - Native file watcher is operational. 2006-03-25 14:34:59,093 INFO - om.intellij.util.ProfilingUtil - Profiling agent is not enabled. Add -Xrunyjpagent:port=10100 to idea.vmoptions if necessary to profile IDEA. when will the v0.5 release of the plugin will be available? First build will be available to the end of this week, it will address Demetra compatibility issues. It seems that exception was not logged for some reason. 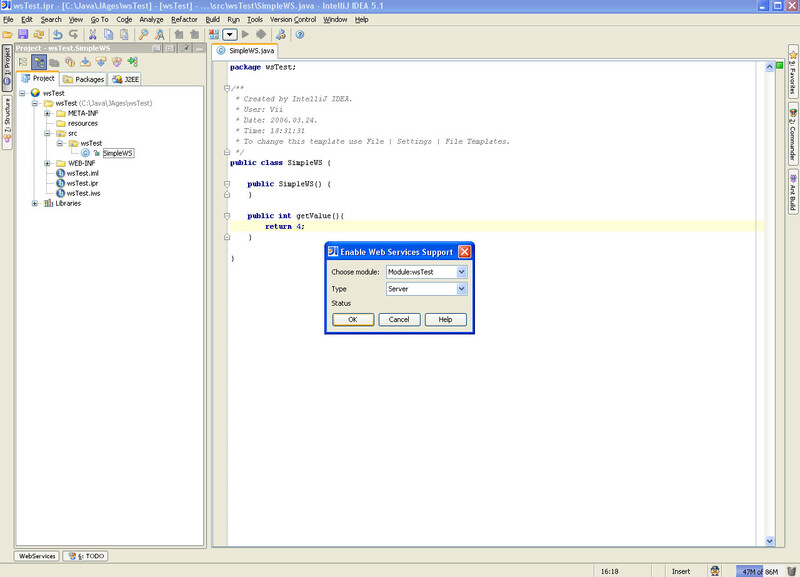 , reproduce the problem and attach idea the log file. Ok. Category tags should be inserted before root. If the problem don't show a newer build of the plugin will contain more problem diagnostic code. 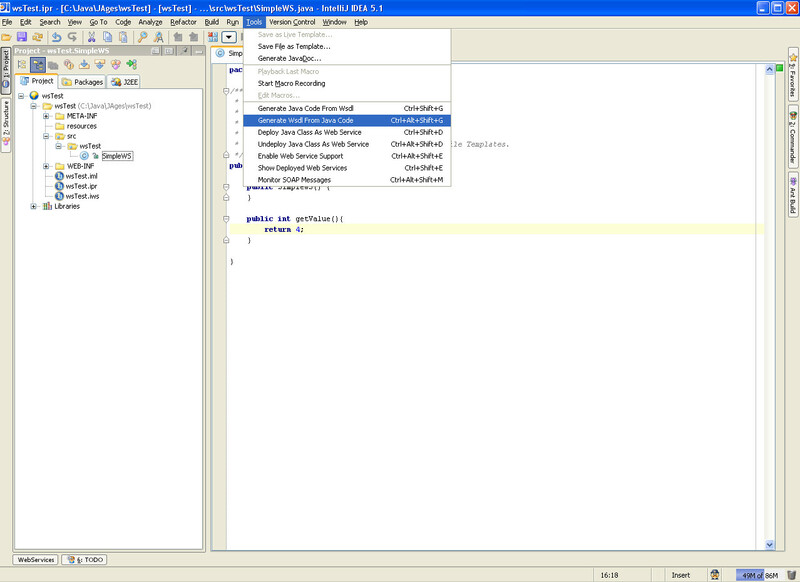 2006-03-28 16:38:18,093 INFO - #com.intellij.idea.Main - Using "FocusKiller" library to prevent focus stealing. 2006-03-28 16:38:19,765 INFO - ecommon.client.impl.ClientImpl - No license server. 2006-03-28 16:38:21,906 INFO - ij.vfs.local.win32.FileWatcher - Native file watcher is operational. 2006-03-28 16:38:24,921 INFO - om.intellij.util.ProfilingUtil - Profiling agent is not enabled. Add -Xrunyjpagent:port=10100 to idea.vmoptions if necessary to profile IDEA. Great, the error in next build will be properly reported in next build. 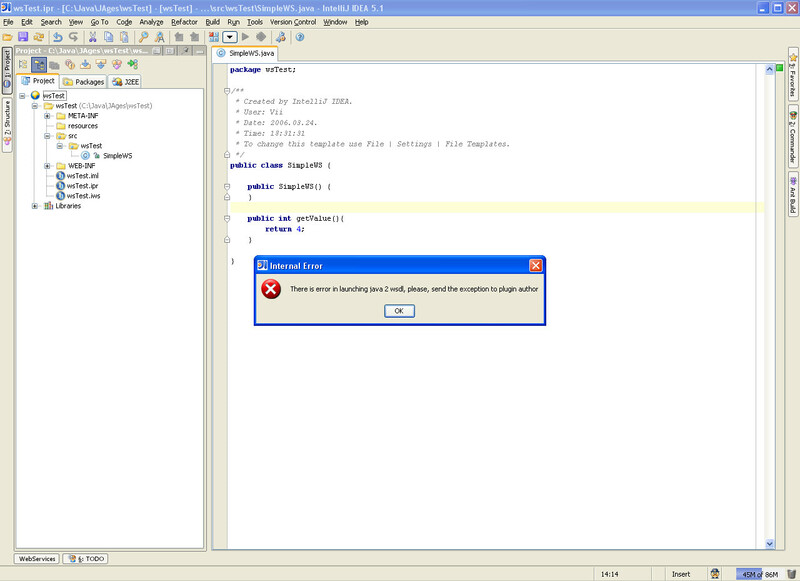 I am having the same problem trying to generate my wsdl from Java. I'm a bit confused on what you are saying - Are you saying that there is an error that you are aware of that will be addressed in the next plugin? Is there a work around in the meantime? Both issues are fixed and will be available at end of the week.